"There is nothing wrong with your television set. Do not attempt to adjust the picture. We are controlling transmission." -- From the introduction to The Outer Limits, 1963-1965. It's been a week since I've posted. And my last post was essentially filler. Perhaps this means that my life has been soporifically boring for the last week or so. On the other hand, since I don't share Emily Gould's philosophy of describing every sordid detail of my personal life for the enjoyment of friends, co-workers, complete strangers, and bounty hunters, perhaps it means that I've actually been in deep cover posing as an insurance salesman while attempting to infiltrate Kim Jong-Il's palace for the last week, as part of my efforts to free the world from the threat of nuclear holocaust. As it turns out, he self insures. Sooooo... anyway. I love movies, and have been in a bit of a retro phase lately. The photo above is from the 1966 film adaptation of "Fahrenheit 451," the 1953 Ray Bradbury classic. I read the book years ago but had never seen the movie, and one day it arrived in my mailbox, having been queued up a long time ago. The story is of a futuristic society where books are illegal, and firemen don't put out fires, they set them. The dystopian vision presented is of a world where emotion and free thinking are suppressed in the interest of creating a happier society. The centerpiece of every household is the television; and self-medicating through a variety of drugs is encouraged. This story was written more than 50 years ago and the movie created more than 40, yet many of the dark visions shown by this story find analogues in our society. Pharmacalogical management of our well being is becoming commonplace. Emotional states such sorrow, depression, or moodiness, once understoond by philosophers as an essential part of the human condition, have become a treatable illness. The solution to problems is a quick fix, a pill, or a surgery. Introspection and emotion -- the kind that might result from reading a book -- is to be avoided at all costs, because it breeds unhappiness. Instead, the television is the only information source, and the media is carefully controlled to ensure the happiness of the populace. 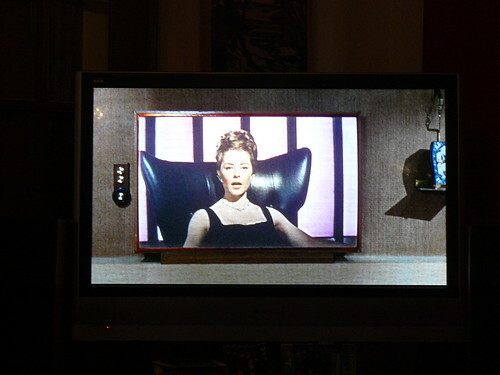 The picture above is a picture of a scene in the movie, showing a flat-panel, wall-mounted televison, in a widescreen configuration, as viewed on my own flat-panel widescreen television. Not bad for 1966. Libel! LOL!! I look forward from hearing from your lawyer. Oh - and Eva says hi? Wow. From the afterlife. Cool. Hi, Eva. I love Eva Cassidy's work and her legacy. That is why I am so angry that you would tarnish her name by trying to profit personally. I have no idea what the rest of your comment means, but we're talking about YOU here and your actions only. Jamie, you have a lot of enemies. I'm sort of jealous. The auction ended bidless as I predicted. (Quite the soothsayer, aren't I? Guessing that nobody would pay a half mil for a couple CDs). Enemies... well, I do talk a lot of trash, but only about those who richly deserve it. And it always makes my day when one of these loonies graces my blog with a reply! You can't pay for that kind of entertainment. Anyway, it's a messy job but someone has to do it. However, I'm just as quick to compliment stand up behavior. p.s. you'll be on my blogroll shortly!